It’s a ho-hum story, really: boy meets girl, boy wins girl’s heart, boy discovers the nature of the universe, boy and girl drift apart. Granted, that third part is key — but not enough to carry a picture. In The Theory of Everything, we’re given a window into the mind and heart of brilliant physicist Stephen Hawking (played here by Eddie Redmayne) via his relationship with first wife Jane Wilde (Felicity Jones). Hawking is diagnosed with a motor neuron disease (similar but not identical to ALS) soon after he meets the young woman at Cambridge; she declares that despite a very bleak prognosis for Stephen, their love is strong enough to withstand the decay and tragedy that will define Hawking’s life. The headline-grabbing attraction here is the performance given by Redmayne, nearly unrecognizable when compared to his role as the handsome Marius in 2012’s Les Miserables. 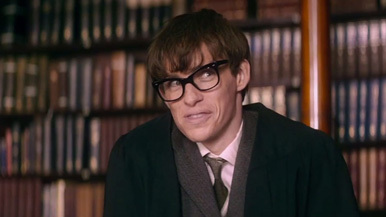 Redmayne convincingly recreates the circumstances of Hawking’s illness and deterioration, acting only via small facial movements by the film’s conclusion. And despite early Oscar buzz — okay, Oscar nomination buzz — I can’t help but feel that the performance was undoubtedly difficult, but in no way profound.